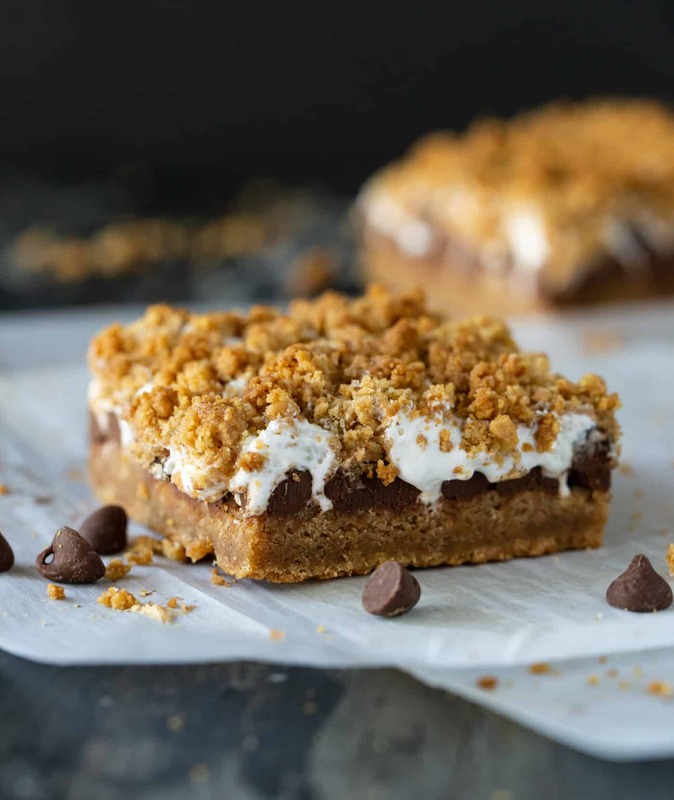 Enjoying s’mores year-round just got a little bit easier with this easy Gooey Baked S’mores Bars Recipe. Around here s’mores are properly roasted over the fire during the summer months. 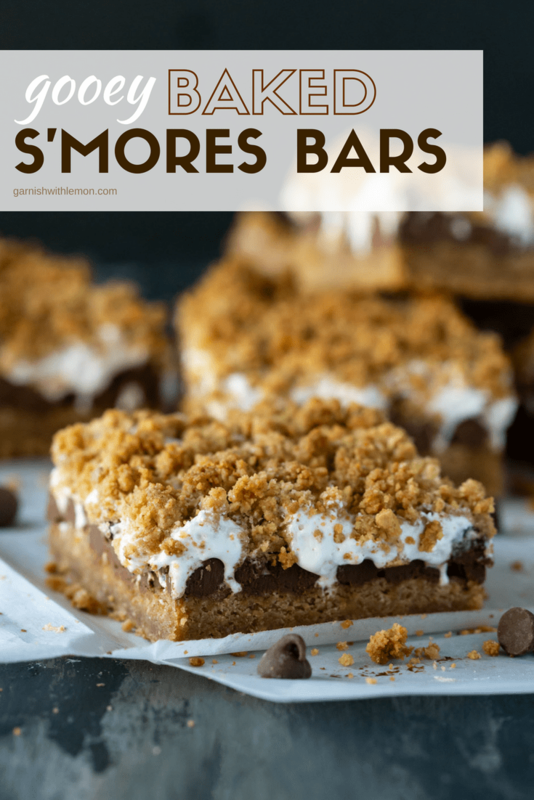 But since Mother Nature occasionally throws a wrench in our outdoor plans, my backup option is always this Gooey Baked S’mores Bars Recipe. Equally messy, equally, chocolatey and equally delicious! Fortunately for those of us who need immediate gratification (hand raised! ), these Gooey Baked S’mores Bars come together quickly. They are fun for the kids to help make, too, and I’ve never seen anyone pass up one of these gooey bars at a party. The only tricky part to making these tasty treats is spreading the marshmallow creme on top of the chocolate chips, so make sure you have some hot water handy for rinsing the back of the spoon periodically. Or do as I do and get yourself one of these handy offset spreaders to make quick work of spreading the marshmallow creme. Works like a charm! Do you like to get all fancy with your s’mores? Shake up the ingredients here. I’m thinking chocolate and peanut butter chips would be a good combo. Or maybe butterscotch chips and caramel bits. Or even chopped up pieces of your favorite candy bar. 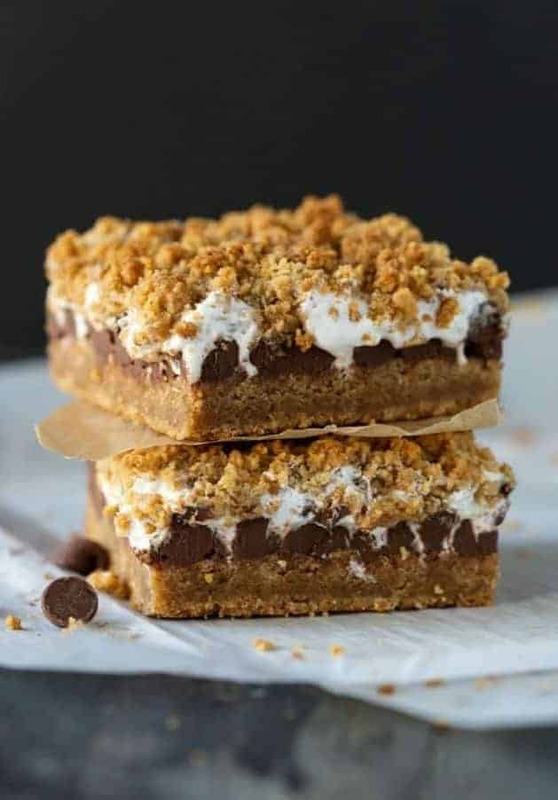 Can I substitute marshmallows for the marshmallow creme in this s’mores bars recipe? You can swap in mini marshmallows for the marshmallow creme BUT the end result will not be quite the same. The reason why is that marshmallows contain gelatin, so they will hold their shape more when baked than marshmallow creme which will melt and spread more evenly. 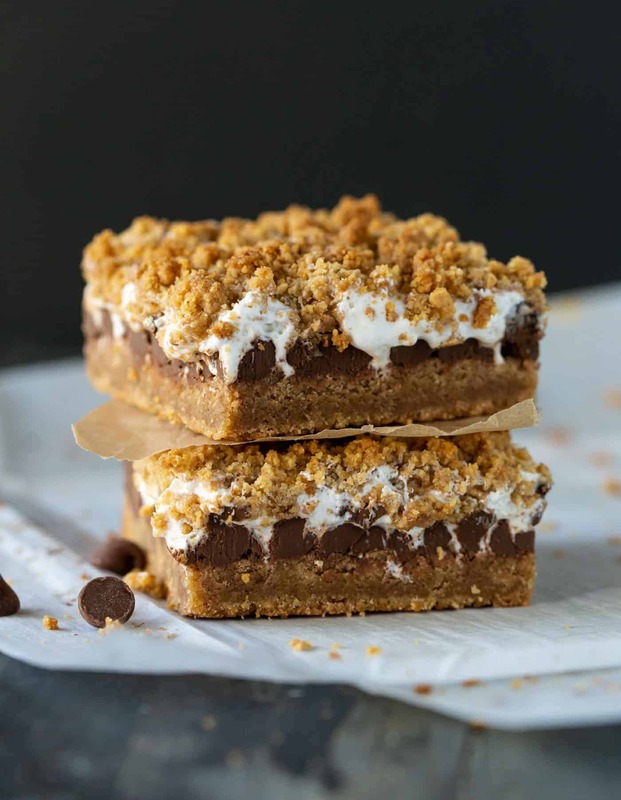 Either option is tasty, but I prefer marshmallow creme for the extra gooey factor they bring theses s’mores bars. You can easily double this recipe for a 9 x 13 pan if you’re hosting a crowd. You can even make them gluten-free if you have guests with food sensitivities by swapping in gluten-free graham crackers and gluten-free flour. 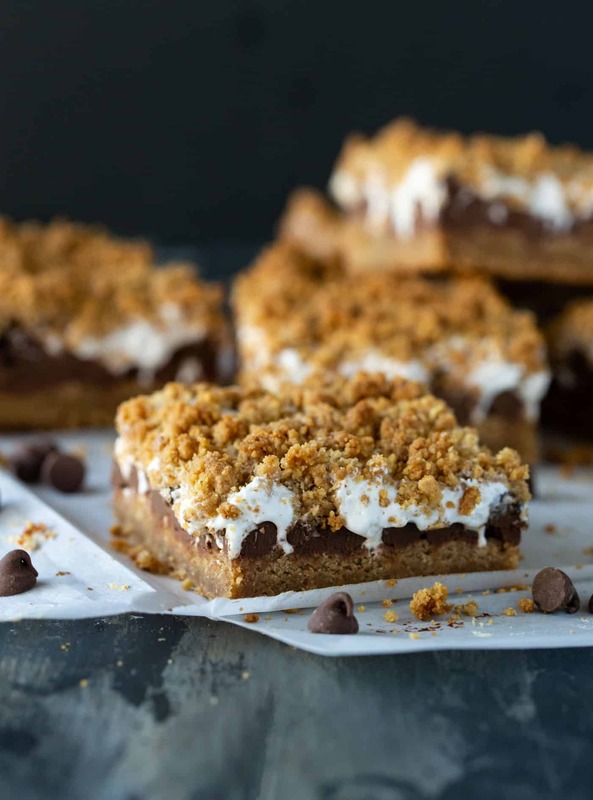 However you serve this Gooey Baked S’mores Bars Recipe, you can be sure they will disappear in an instant! Looking for s’more? (Pun intended!) Get your s’mores fix with any number of these delicious s’mores recipes! Preheat oven to 350 degrees. Line an 7 x 11 pan with foil (overhanging the sides) and spray with cooking spray. Set aside. In a small bowl, whisk together graham cracker crumbs, flour and salt. In a medium bowl, beat together sugar, butter, vanilla and egg for about 2 minutes. Stir in flour mixture until thoroughly combined. Reserve 2 cups of this mixture. Press the remaining mixture into the bottom of the pan for the crust. Evenly layer chocolate chips on top of crust. Drop spoonfuls of marshmallow creme over the chocolate chips. Using the back of a spoon warmed with hot water gently spread creme evenly over the chips, stopping to rinse spoon and warm with water as needed. Sprinkle the reserved graham mixture over the top. Bake for 27-30 minutes or until marshmallow creme starts to lightly brown. Cool thoroughly before lifting foil from pan and cutting into squares. What a fun way to enjoy s’mores! My girls will be thrilled with these! My kids Looooooved them, Kristy! Oh, these look incredible! Love that gooey marshmallow layer! I agree; the goo is pretty appealing! I’ve made the Betty Crocker version and they are absolutely addicting! I love how you added the crumble for something extra. Gotta make these your way! Now you’ll have a good point of comparison, Jess. I think the crumble makes them even tastier! I can never say no to s’mores! Love the marshmallow goo coming out! Yum! How in the world did you get them cut into such perfect squares? Mine always come out with ragged edges. Hi Jeannie, try running your knife under hot water (and wipe dry) each time you make a cut. That should help. Enjoy! Thank you for the tip! They are beautiful and look delicious!